Today, diabetes is the most costly and burdensome chronic disease. The severity of diabetes is reducing with anticipation, premature recognition, and the early supervision impediments in people. These symptoms are the optimization of the diagnosis phase of the disease through the process of evaluating symptomatic characteristics and daily habits of patients. Big data analytical tools play a useful task in executing significant real-time investigation on the huge volumes of data and are also used to foresee the crisis situations earlier than it occurs. This chapter accomplished an efficient assessment of the applications of machine learning algorithms and tools in the diabetes investigation relating to genetic background and environment. With improving accuracy for early detection and prevention of diabetes, this chapter implemented a fuzzy linear and logistic regression model with fuzzy clustering for predicting early detection of diabetes. In recent year’s, the population of diabetic patients in the world has been increased more than 382 million. Surveys and researches have predicted that the prevalence of diabetes will increase by 55% in the next decade. The observation of diabetic (Federation, I. df diabetes atlas 2013, Kaul et al.,2013) impact in claim to be one death every 6 to 10 seconds. Diabetes is a multifaceted devastating illness that can result in severe impediments such as high glucose levels in body blood, which leads to opposing insulin (Beloufa et al.,2013; Thirugnanam et al.,2012; Varma et al.,2014). To determine and predict the occurrences of diabetic conditions, which utilized the present and old data with statistical or analytical models that includes a diversity of methods in predictive analysis (Mishra et al.,2012). Health care systems are applying big data analytics, techniques like Analytical prediction, decision making analysis. In this chapter utilize the prognostic analysis algorithm in Hadoop to forecast the category of diabetes, associated impediments and treatment to be analyzed. The methodology proposed in this chapter provides an efficient way to predict early detection of diabetic. 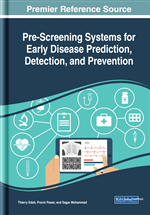 Researchers implement many numbers of associated works about the use of intelligent methods in the medical sector for detection and prevention of diabetes (Muthukaruppan et al.,2012, Sikchi et al., 2012, Kumar et al.,2013, Sikchi et al.,2013). Physicians make use of computational techniques to aid in the analysis and provide medicinal analysis suggestions as is filled of vagueness. For dealing with vagueness, efficient techniques are incorporating by Fuzzy Logic and neural network (Opeyemi et al.,2012).